Once again, I was attempting to track down some more food carts to try - specifically the new hot dog cart offered up by Chef Wolfe from Kaboom Box. As I was pulling up to their location on Hastings at Hornby, I heard a few loud thuds on the room of my car. WTF? What happened??? Totally distracted by the fact, I drove past Burrard and parked on Hastings to check it out. For the love of... The whole car was covered in birdsh*t! It looked as if a whole flock of seagulls ate the contents of a Stagg delivery truck. I was so rattled at this development that I didn't end up going for a hot dog (especially a chili dog). 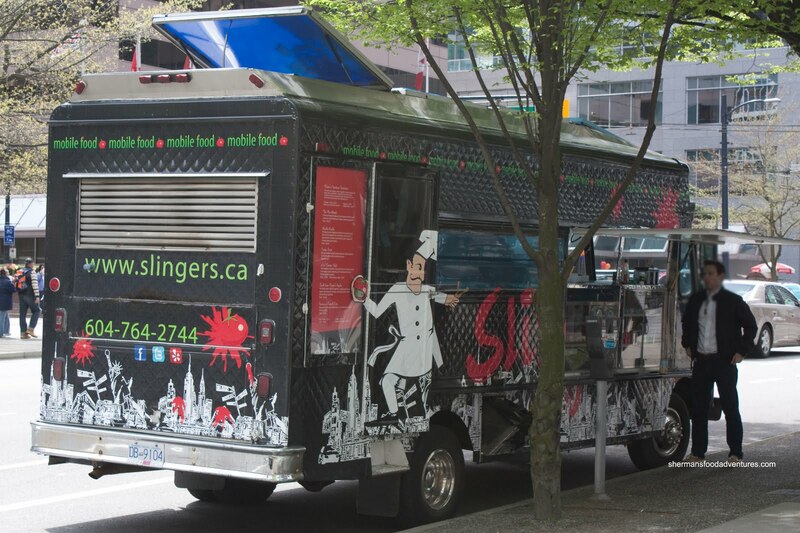 Hence, I walked up to the first thing I saw which was the Slinger's Food Truck. Much like the Roaming Dragon and Coma, Slingers changes location regularly and I was lucky to catch them. Of the items on the menu that caught my interest was the Angry Mac 'n Cheese. Essentially a regular mac 'n cheese with the addition of spicy chipotle, I personally didn't think it was really all that spicy. It certainly had a kick to it; but maybe I have a high tolerance. Furthermore, I didn't find it that "cheesy". Lots of cheese sauce, just not a lot of natural cheese taste. 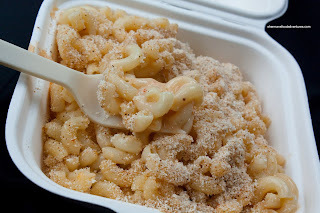 Ultimately, I think t hey should've call it "moderately annoyed" mac 'n cheese instead. For my second item, I tried their Veal Parmigiana Sandwich. At almost $8.00, this is slightly more expensive than some of the other sandwich offerings from many food carts. However, the sandwich itself is decently filling. 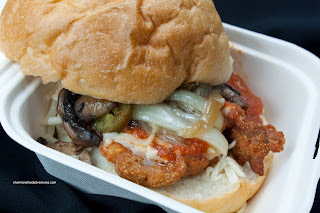 It consists of a crispy fried veal cutlet topped with tomato sauce, cheese, jalapenos and sauteed mushrooms and onions. For me, I thought the jalapenos added a necessary kick and tartness to the sandwich. I found the veal to be relatively tender with a pleasing crunch. I was a bit indifferent with the bun though. Either it could've been a little less chewy or they could've toasted it a bit more. With that being said, it held up to the ingredients, which is most important. It is worth noting that they use biodegradable packaging which I give them the thumbs up. 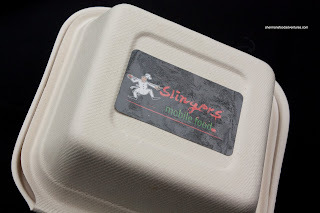 For the 2 items I did try, the food is generally acceptable and generally well-priced. I probably won't go in search of Slingers around town; but I wouldn't necessarily avoid them either if they were nearby.
" Food in general is middle of the road ...."
Mac and Cheese with the addition of chipotle does not sound appealing to me at all! @Kat Well, it sounded appealing to me, but it really didn't work out.